The Crocker Galleria Rooftop POPO is hidden over a bank vault in San Francisco. If you are sticking around the Bay Area this weekend, here is our shortlist of things worth checking out. 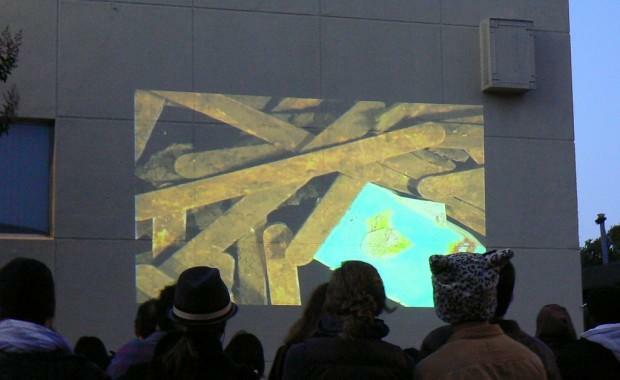 Outdoor film screening in Oakland's Temescal Neighborhood. Tonight, Temescal Street Cinema presents “On Her Own,” the documentary that tells the story of Nancy Prebilich and her family as they struggle to save their 5th generation farm during the recent economic recession. You might have heard an interview with Nancy, about the film, on KALW’s Crosscurrents back in June. Tonight you can see the documentary, for free, on 49th Street at Telegraph in Oakland. Festivities, including live music, begin at 8:00 p.m., and the film starts at 8:45 p.m. You’re recommended to stake a spot on the street early, and bring your own seat. 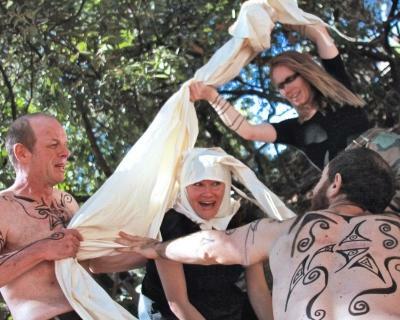 "King Lear" comes to Berkeley's John Hinkel Park. Credit Photo by Vicki Victoria. On Saturday, Berkeley’s John Hinkel Park amphitheater transforms into a mini-Globe, as it hosts Shakespeare’s “King Lear,” presented by Berkeley’s Inferno Theatre and Actors Ensemble. This production condenses and intensifies this seminal family tragedy with striking visuals, physicality and live music. The amphitheatre opens at 3:00 p.m. for picnicking, curtain at 4:00 p.m. More details are available at aeofberkeley.org. If you’re more in a mood to wander this weekend, there are always POPOS! (Also known as Privately Owned Public Open Spaces.) Many have benches, greenery, and fountains. Sometimes they’re tucked away in the ground floor of a financial services building, and sometimes they’re on the roof, 50 stories above the city. Everyone is welcome, but you just have to know where to look. You’ll find a map with detailed descriptions at SFPOPOS.co. Is there an event happening this weekend that you'd like folks to know about? Feel free to add it below in the comments section. If you are not looking for a good spot to view fireworks this weekend, we have some alternative ideas on what to do around the Bay Area. Do you know where you’ll be this weekend? If you are hoping to find some fun without traveling too far, we have a few highlights on what to see and do over the weekend here in the Bay Area. If you are looking for unique suggestions on what to do around the Bay Area this weekend, you are in luck! We have a few hand-picked choices, just for you. We have handpicked a few suggestions on how to spend your weekend here in our lovely Bay Area.